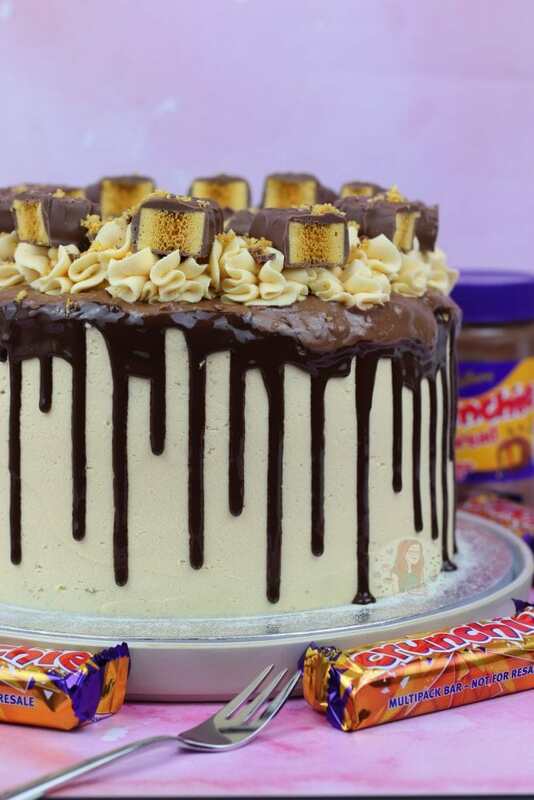 A Chocolate Three Layer Drip Cake with Honey Buttercream Frosting, a Chocolate Drip, Crunchie Spread and even more Crunchie – a Crunchie Drip Cake! So I’m always fan of producing ‘showstopper’ type recipes, because I just think they look amazing. They’re something you could produce for a birthday, a party, or just any form of celebration… and Drip Cakes are perfect for this. They just always look amazing, and everybody loves them. Something about them makes them a lot more showstopper than a regular cake! 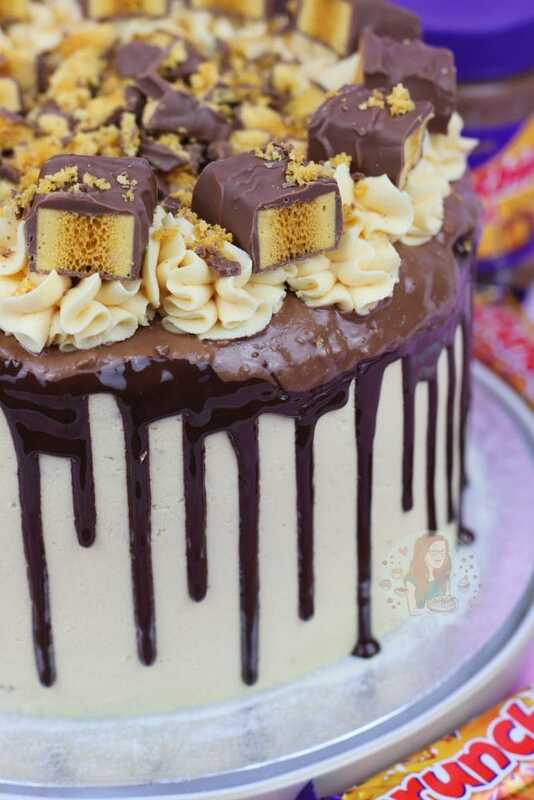 My Honeycomb Crunchie Cake is one of the most popular cakes on my blog because its basically irresistible. Along with my Honeycomb Crunchie Cupcakes, they’re just delicious. Both incorporate the same flavours as this new recipe does, because I think its the best recipe I’ve got for the theme. 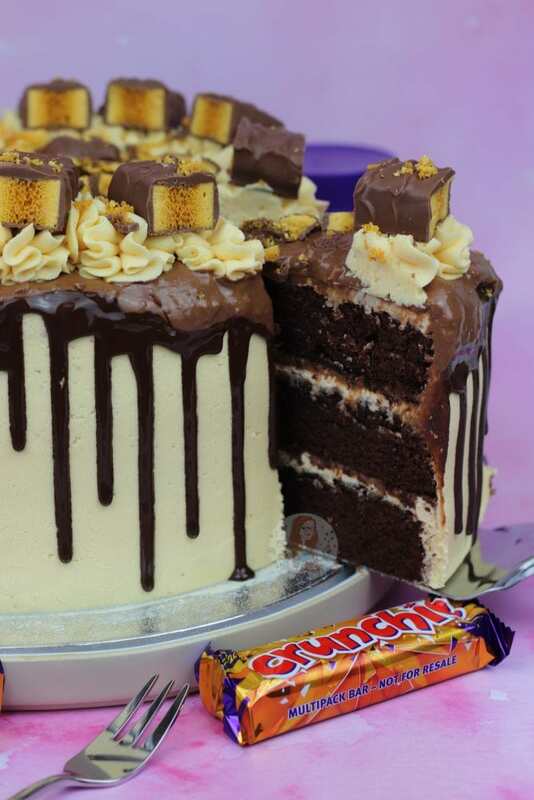 The sponges in the Honeycomb Crunchie Cupcakes and Honeycomb Crunchie Cake are Chocolate, with a Honey Buttercream Frosting… and you all LOVE it. The Honey Buttercream frosting is something I randomly made when I was developing the other recipes, and its just wonderful. Oddly, I find it makes the frosting slightly less sweet, but still incredibly delicious. For this particular one, I had to use less Honey for the this buttercream in comparison to the others, as it needs to hold better. When making a Drip Cake you need the buttercream to be stiffer in comparison to a regular cake, because it needs to withstand being sideways. Therefore, I used 100g of clear honey in this buttercream, but more sugar and butter in comparison to my Honeycomb Crunchie Cake. You can of course leave the honey out completely. If its a really hot summers day like its been recently, this might be an idea. When its really hot weather, you don’t really want to add any extra liquid to buttercream if you can help it. The room temperature butter, and the icing sugar, is all you want. However, if the taste of the honey is amazing…. so its up to you. When I made this, I did use the honey, and it worked wonderfully. If you seem to struggle with buttercream being stiff in general, you might want to check the ingredients you are using. I use supermarket own UNSALTED BUTTER. I do NOT use a spread such as stork, or a baking spread, or flora for buttercream. They are far too soft, and will result in a softer buttercream. Actual unsalted butter is the only way to go in my opinion. Making sure the buttercream is at room temperature before you mix it is also important, as that means it will mix into the sugar better. Try not to heat the butter to get it to this either as that can mess with the butter. You can see from the images that I did do this cake slightly different to my other drip cakes such as my Oreo Drip Cake. In my Oreo Drip Cake I make the drip in the same way, but I add it onto the top of the cake as well. For this one, as I was using the crunchie spread in the middle, I thought I would use it on the top as well. And I am so glad I did because it looks delicious, and it tastes amazing. Crunchie spread if you haven’t tried it is literally like a chocolate spread, with little bits of honeycomb in, and it tastes insane. If you don’t have access to it, you can either swap it to a different spread, or just leave it out. It’s currently available in the UK, which is where I am from, so if you’re outside the UK you might struggle to find it. 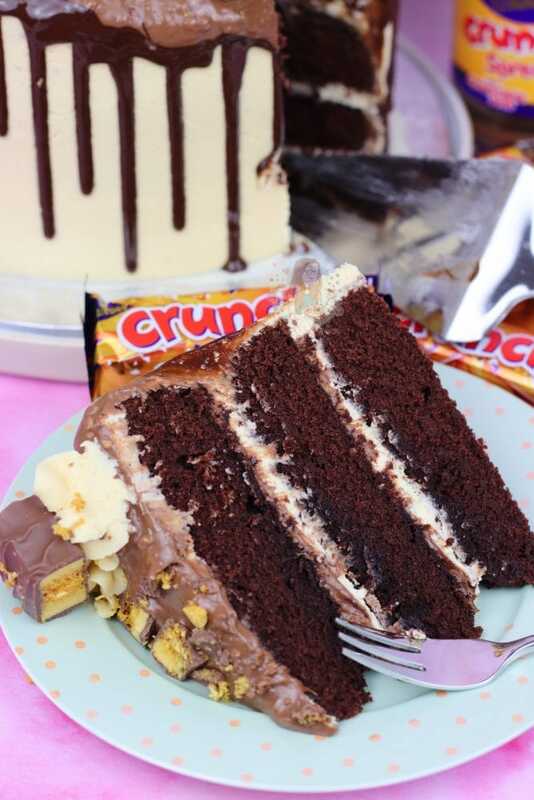 When you slice this cake you get three layers of fudgey chocolate cake, honey buttercream frosting and crunchie spread. In every bit you get the same as well, and its utterly delicious. This sponge is eeeever so slightly different because I basically made the dry ingredients slightly more than a regular ‘Victoria sponge’ type cake, and it made it more fudgey. I just wanted to demonstrate this type of cake as it basically makes it more madeira like, and easier to decorate! If you don’t want to do this however, simple use 330g self raising flour, and 70g cocoa powder to make up the 400g! The easiest way to do the drips for this, is to use a small disposable piping bag. All you have to do is pour the drip ingredients once made into it, a snip off the end (only a small snip) and then gradually let it drip down the side. It’s rather hard to explain, but if the drip is the correct consistency, it will just fall out of the piping bag, so you simply have to hover it over the edge and it will drip down. The longer you leave it there, the longer the drip will be. It’s a matter of practice, but you’ll get used to it! 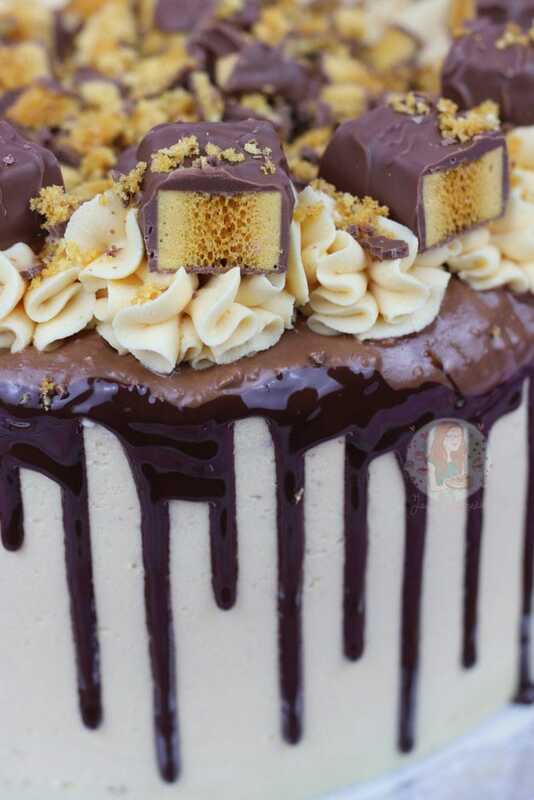 A Chocolate Three Layer Drip Cake with Honey Buttercream Frosting, a Chocolate Drip, Crunchie Spread and even more Crunchie! In a stand mixer, beat together the butter and light brown sugar until light and fluffy. Add in the flour, cocoa powder and eggs and beat again briefly till combined – try not to over beat the mixture! Add in the honey and beat again till combined. 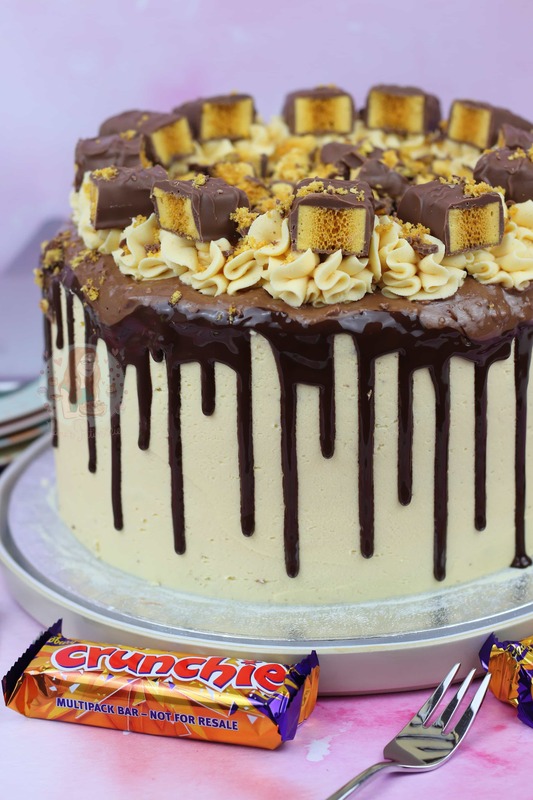 Once the cakes are cooled, put the first layer on the serving plate - spread one or tablespoons of the buttercream onto the top of the first layer, and spread over a tablespoon of the Crunchie Spread. Add the second cake on top, and then top again with some of buttercream and Crunchie spread, and then add the final sponge layer. After its crusted a bit, spread the rest of the buttercream around the edges and top. Naturally you will wipe some off again with making the edges smooth, and this is what you will use to pipe on top later. Once finished, melt the dark chocolate in a heat proof bowl until melted. Add in 1/2 tbsp of oil and beat till smooth. Using disposable piping bags, pipe it round the edge of the cake, edging over slight bits to create the drip. 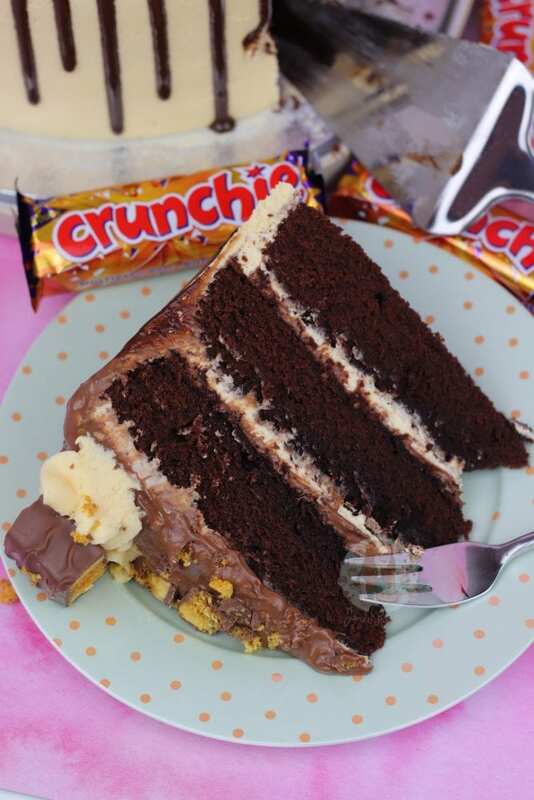 Leave it to set for about 10 minutes, and then add some more crunchie spread on top. 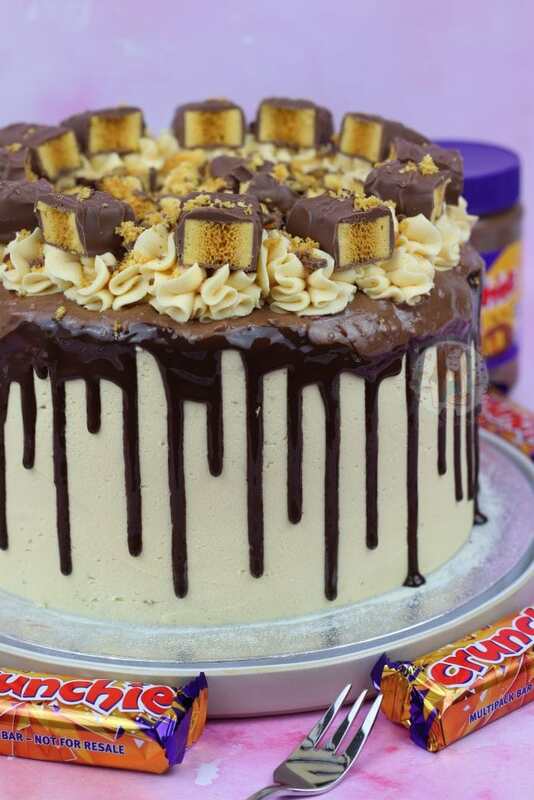 Alternatively, add the Crunchie spread on the top first, and then drip around the edges. 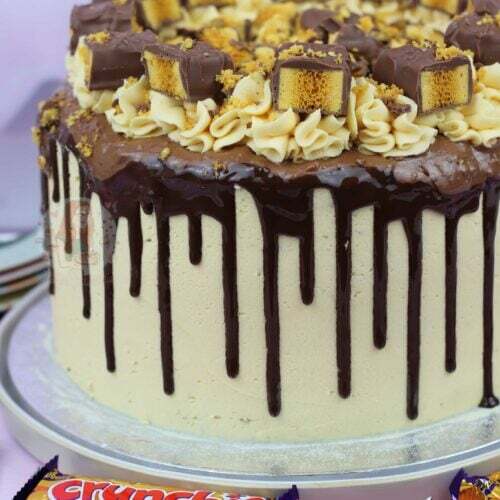 I only used the drips around the edge in this cake, and didn't cover the top because of the Crunchie Spread. 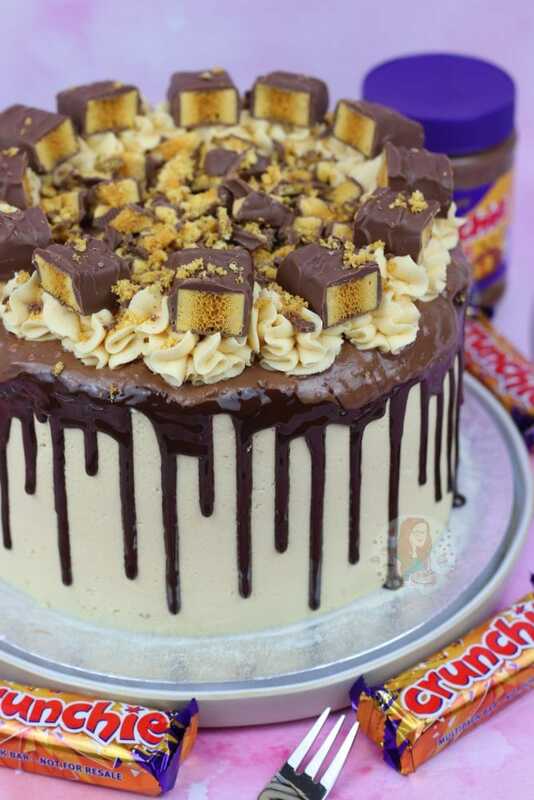 Leave the chocolate/spread to set for about 10 minutes or so, and then pipe the rest of the buttercream on top, and add on some crunchie pieces, and chopped up sprinkles of crunchie to finish. 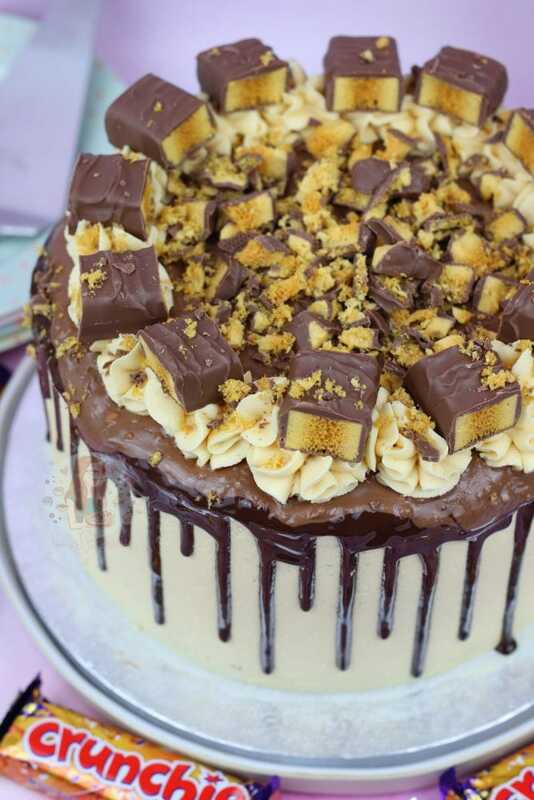 Find my other Drip Cake & Crunchie Recipes on my Recipes Page! Older Next post: Neapolitan Macarons! Newer Previous post: Lemon Curd Mousse! I’d like to make the cake taller, would it be possible just to split the mixture into 6″ tins instead or would it not work? It’s for my dad’s retirement, love your bakes. Fab recipe it sounds great! Do you use 3 sandwich tins or 3 deep cake tins? All my tins are about 3-4″ deep, but the cakes don’t come up that high so Im sure three sandwich tins should be alright just keep an eye on them!